The Mobile Business Pro Series includes the comfortable new Sennheiser MB Pro 2 Bluetooth headset that offers a wireless solution for phone calls with softphones and mobile phones with outstanding sound quality. This binaural or double-sided headset features a built-in ultra-noise cancelling microphone that filters away background noise to deliver the ultimate speech intelligibility for professionals. Sennheiser Room Experience is specially designed for all-day users to reduce listener fatigue. It works by externalising the sound from your head, giving you the impression of talking to someone in the same room. The delivery of more realistic sound ensures a more natural and more comfortable listening experience. In addition to Sennheiser’s legendary HD sound that provides a natural, crystal-clear audio experience, the MB Pro 2 headsets come equipped with an ultra noise-cancelling microphone that filters out background noise for great speech transmission in busy and noisy environments. Furthermore, the single-channel noise reduction system minimises background noise, such as air conditioning fans and vehicle road noise for clearer sound. The MB Pro 2 comes with a 25 meter range to provide professionals with flexibility and mobility to communicate away from their desks in the offices, as well as on the move. 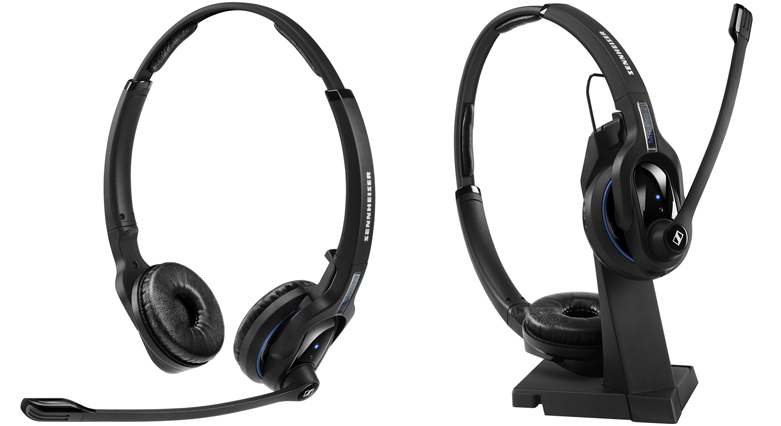 The headset also complies with the Bluetooth 4.0 standard, which makes it compatible with all Bluetooth devices with a headset profile (HSP), hands-free profile (HFP), or an advanced audio distribution profile (A2DP). So, the headset offers wireless freedom to give hands-free convenience and seamless call switching between multiple devices. For instance, you can switch calls between a Bluetooth enabled desk phone and mobile phone using one headset for up to 15 hours on a fully charged battery. Who should buy this headset? In addition to the excellent sound quality, wireless communication freedom, and multi-connectivity, this headset features an award winning design and top-notch craftsmanship to give you a perfect fit and all-day wearing comfort with those large leatherette ear-pads. This entry was posted in General on 24/11/2014 by Max.